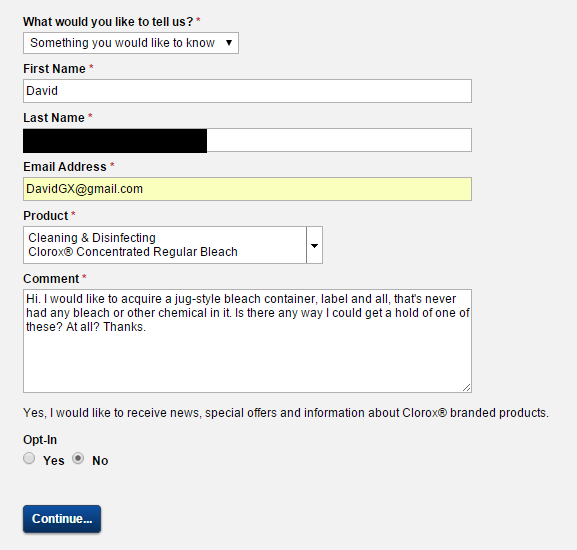 Update: So I just got an email back from Clorox and, as expected, no dice. Oh well. It was a slightly-amusing idea, I think. So I've just got a random idea. I'd like to acquire a Clorox Bleach container, but one that's never had any bleach or other chemical in it. So I could fill it with a beverage and drink from it. Great idea? Greatest idea? You be the judge. I figure the only way I could get a hold of one, would be the contact the company itself. So let's try. First, I'll try to email them. Also, I'll send them a tweet. Will it work? I'm guessing not. But it's late and this is when I tend to get stupid ideas. If anyone out there has any idea how I might acquire one of these (NOT cleaned! It has to have never had any actual bleach or other chemicals in it.) let me know. If I get a response one way or the other, I'll update this post. Update: I know this was posted on April 1st but it's not a joke. Update 2: WayForward (creators of the Shantae series) are on board! Twitter post. Gentlemen, ladies, we have a great task before us. Fate has handed us an opportunity that may never come again and we must seize it. On this day, of all days, Nintendo has put up this page allowing us to vote on what characters we'd like to see in the new Smash Bros for Wii U and 3DS. Our mission, which we have been waiting for all our lives, is to go to that page and vote for Shantae. "Who is Shantae?" you ask. I respond by slapping your face. Shantae is one of the most awesome characters and game series to come along in a while. Here's a trailer from the most recent title, Shantae and the Pirate's Curse. It's available for both 3DS and Wii U. And here's a (very early) Kickstarter trailer for their upcoming, fully HD game Shantae Half Genie Hero. It's an amazing series with an awesome main character. The previous game, Shantae Risky's Revenge is also available on PC via Steam. Either way, I encourage you to give the series a look. Once you do you'll know why we must get Shantae in Smash Bros. So I BEG you, go Vote for Shantae right now!